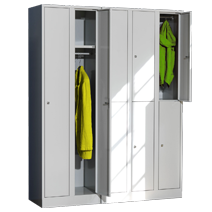 Clothes cabinets are the classic products in the diversified steel cabinet range by EUGEN WOLF. They are suitable for the most different challenges thanks to their versatile setup. At the office, at the workshop, at kindergarten and school, at wellness and sports facilities, and many more. 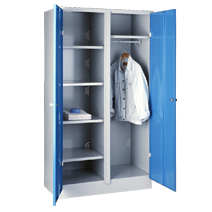 You can order our clothes cabinets with one- or two-level compartments, with full panel, perforated sheet or smooth doors, extra-high or especially low, with or without feet or benches. And always in the approved EUGEN WOLF quality, tested and monitored by the TÜV Product Service. Doors with ventilation slots and label frames, fastened to interior hinges. With shelf, clothes rack and movable hook. Sheet steel feet or all around sealed base. Deliverable with 1, 2, 3, 4 and 5 compartments. 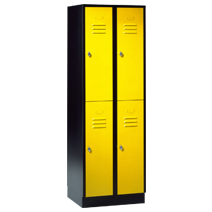 Extensive equipment and accessories range such as cylinder lock, master key system, partition, slanting top or numbering. With clothes rack and movable hook. 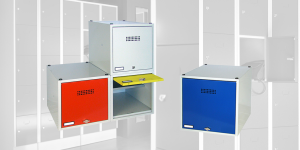 Deliverable with 1, 2, 3, 4 and 5 compartments (2, 4, 6, 8 and 10 shelves). Bench in front made from square steel tube with 3 hardwood beech seat strips 60 x 25 mm with rounded edges, colorless finish. Bench with adjustable floor gliders to even out surface irregularities. 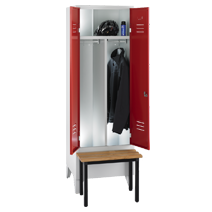 Standard bench base frame color: anthracite gray RAL 7016. 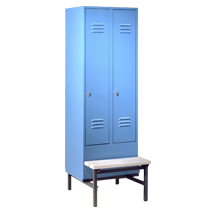 Extensive equipment and accessories range such as cylinder lock, master key system, partition, slanting top, shoe rack, PVC seat strips or numbering. Sealed base of 50 mm height. Bench base made from square steel tube with 2 reinforced PVC seat strips. 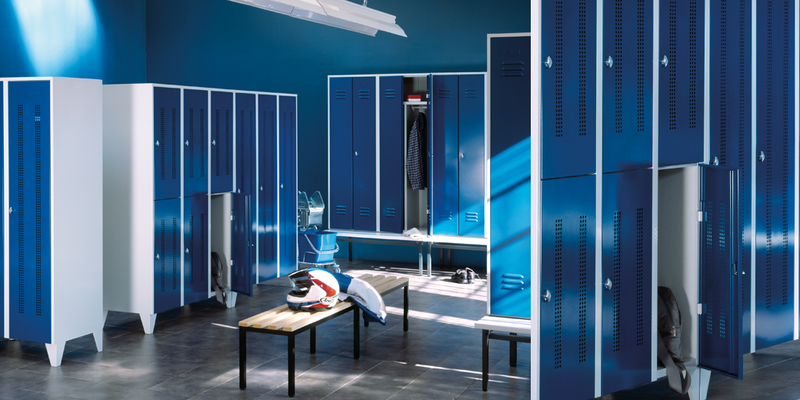 Extensive equipment and accessories range such as cylinder lock, master key system, partition, slanting top, beechwood seat strips, shoe rack or numbering. Sealed base of 50 mm height . 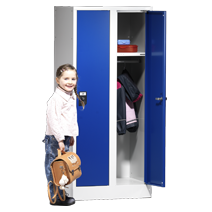 Extensive equipment and accessories range such as cylinder lock, master key system, partition, slanting top, shoe rack, beechwood seat strips or numbering. Compartment width 600 mm, with fixed partition. 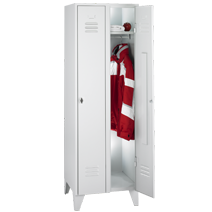 According to workplace guidelines for separated storage of work and street clothes. Deliverable with 1 or 2 compartments. Bench below or in front made from square steel tube with 2 reinforced PVC or 3 hardwood beech seat strips 60 x 25 mm with rounded edges, colorless finish. 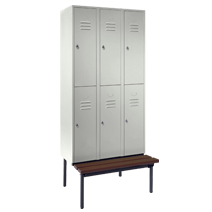 Extensive equipment and accessories range such as cylinder lock, master key system, partition, slanting top, shoe rack or numbering. 4 shelves, clothes rack or suspension rod and hook. Compartment width 300 and 350 mm. High-quality stove-enamel, various full finishes as standard selections. Extensive equipment and accessories range such as cylinder lock, master key system, slanting top or numbering. Smooth doors, fastened to interior hinges, ventilation via hole pattern in the back wall. 2 interior designs available: Shelve, clothes rack and movable hook or 4 shelves. Security cylinder lock with 2 keys. Extensive equipment and accessories range such as master key system, deposit lock, slanting top or numbering. 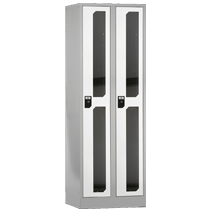 Improved burglary protection due to integrated door reinforcement and door profiles integrated into the casing; doors mounted with rotary bolt. Door opening stop with 100° opening angle and integrated door-closing shock absorber. Security cabinet bolt for padlock, cracking by overtightening impossible, can be turned 360° when locked. 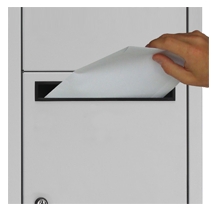 Integrated door protection made from plastic, extendable with cabinet numbering. Floor-protecting galvanized cabinet feet or all around sealed base, improved corrosion protection, both models available with height-adjustable plastic gliders. Alternatively also available with bench installed below or in front. Ventilation via easy-to-clean hole pattern in the doors and the back wall. Deliverable with 1, 2, 3 and 4 compartments. 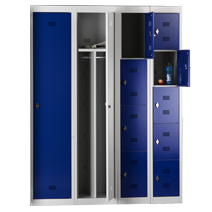 Extensive equipment and accessories range such as cylinder lock, master key system, partition, slanting top, shoe rack, acrylic glass door or numbering. High-quality stove-enamel, corpus color light gray RAL 7035. 4 different door finishes as standard selections, special finishes possible on request. Security cylinder lock with 2 keys or cabinet bolt for padlock, cracking by overtightening impossible, can be turned 360° when locked. Floor-protecting all around sealed base, improved corrosion protection, both models available with height-adjustable plastic gliders. Deliverable with 2 or 3 compartments. Compartment width 300 or 400 mm, further dimensions on demand. Cabinet depth 300 or 500 mm. 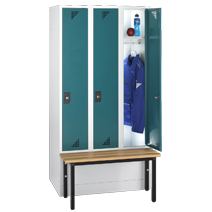 Extensive equipment and accessories range such as covering plate, master key system, partition, slanting top attachment, acrylic glass door or numbering. Smooth doors, fastened to interior hinges or hinge band. 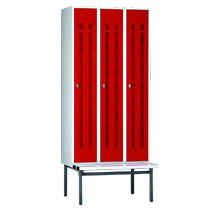 Clothes or security cabinet partition with a choice of 1 compartment or 2, 3, 4 or 5 stacked compartments. 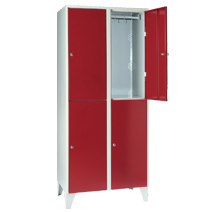 Extensive equipment and accessories range such as deposit lock, master key system, partition, slanting top, acrylic glass door or numbering. Cabinet bolt for padlocks or security cylinder lock and 2 keys, with integrated door protection made from plastic. Ventilation via easy-to-clean hole pattern in the doors. 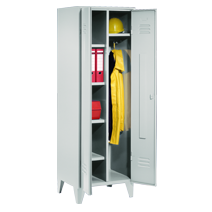 Clothes or security cabinet partition with a choice of 1 compartment or 2, 3, 4 or 5 stacked shelves. 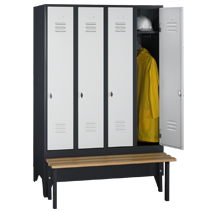 Sturdy disassembled sheet steel construction with individual push-fit elements, easy self-assembly without screws, safety splays to avoid injuries. Extendable with various combinable basic and additional elements. Smooth door fronts with easy-to-clean hole pattern. Additional ventilation via hole pattern in the back wall. Doors mounted with rotary bolt. Cabinet bolt for padlocks or security cylinder lock with 2 keys. Compartment depth 300 or 400 mm. Compact packaging dimensions, small transport volume. Extra-high model, 1950 mm overall height including all around sealed base of 100 mm. Smooth doors, improved burglary protection thanks to integrated door reinforcement and door profiles integrated into the casing. Doors fastened to interior hinges. Deliverable with 1, 2 and 3 compartments. 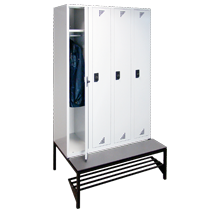 Clothes or security cabinet partition with a choice of 1 compartment or 2 or 5 stacked compartments. 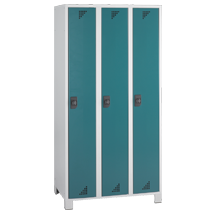 Extensive equipment and accessories range such as deposit lock, master key system, partition, slanting top attachment, acrylic glass door or numbering.